Take a safari through Africa! Opened in 1995, the Zoo's African exhibit, unlike any other zoo exhibits in the Midwest, encompasses 95 acres of realistic scenery, expansive exhibits and more than 400 animals. The first destination on the tour is the Okavango Delta in Botswana, where visitors encounter six female elephants roaming through a 4.5-acre exhibit with a pond, mudbaths, and natural landscaping. This elephant sanctuary, an authentic recreation of the grasslands of Botswana, has no bars separating these extraordinary creatures from spectators, allowing the enormity and reality of the massive pachyderms to be felt by all. Crossing into Kenya, animal lovers gaze over a 17-acre plains exhibit filled with sable antelope, beisa oryx, impala and greater kudu. Surrounding the plains are exhibits which afford wonderful views of cheetah, lion, black rhino and hippo. Visitors can enjoy a breathtaking view of the plains on a safari boat ride which travels Lake Nakuru, or picnic in the treetops as giraffes forage for leaves at eye level. The Congolese Forest offers close encounters with leopard, bongo, and lowland gorillas. Tanzania is the next stop in Africa, showcasing the zoo's chimpanzee troupe. This exhibit is a favorite for many visitors who enjoy the interaction of the chimps frolicking on a hillside through a 40 foot viewing window. The final stop in Africa is Uganda, where guests can view baboons, lemurs, jackals and Aldabra tortoise. The African journey begins and ends in the Nanyuki Market where guests can enjoy snacks at Tamu-Tamu, purchase souvenirs at the Equator gift shop or relax in the Rafaki restaurant. A favorite among children ever since the Lion King, the Zoo's meerkats are featured in Africa. Very vocal animals, one meerkat usually stands sentry to watch out for predators or other intruding meerkat groups. The fastest of all land animals, the chettah can sprint up to 60 miles per hour. Thursday evening Sunset Safaris are an excellent time to see the cheetah when they are most active. The Zoo is home to four male silverback gorillas. Guests enjoy observing the behavior of these massive animals, who are six times stronger than man. The Zoo has enjoyed two giraffe births in the past 18 months, and guests delight in watching these graceful animals mature. G'day Mates! The next adventure will take spectators to the "land down under" as they explore Australia. The tour begins at Gundagai Station with a free, short movie highlighting the colorful wildlife from the world's smallest continent. A walk through an aviary with 20 species of birds and mammals marks the entrance into Australia. Next, visitors find themselves surrounded by kangaroo and emu. These curious animals enjoy full access to paths in this free-roaming exhibit, allowing for up-close sightseeing. Dingo, wallaby, cassowary and tree kangaroo also lurk along the way. A visit to the sheep station may lead to a camel ride, offering a birds-eye view of the area. The Australian journey ends at Gundagai Station where visitors may choose to take a train ride, browse in Bluey's Gift Store, or enjoy the 40-foot-long Aboriginal mural, the largest installation of Aboriginal art in the United States. 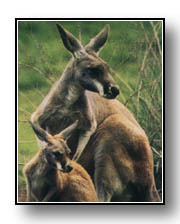 Don't be surprised if you encounter a kangaroo hopping across your path on your journey through Australia. More than 30 free-roaming kangaroo make their home in this unique exhibit. The Zoo participates in more than 20 Species Survival Plans, a cooperative breeding effort between zoos to ensure the genetic diversity of individual species. The tree kangaroo is an endangered species which the Zoo hopes to breed in the future. The Zoo features two walk-through aviaries which are filled with colorful and active birds and mammals. This sulfer-crested cockatoo makes its home in the woodland aviary in Australia. 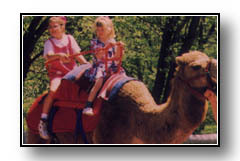 Camel rides are a sure hit for both children and adults. Kids can also be treated to pony, train, boat and paddleboat rides at the Zoo. The International Festival gives guests the chance to see, and touch exotic and domesticated animals from around the world. Farmland in the U.S. A. offers an interactive way to learn about the centuries-old traditions and wide variety of animals used in agriculture. Before the journey ends, be sure to enter the mysterious world of the Komodo dragon, which will be on exhibit from May 2-September 7, 1998. This special exhibit, sponsored by Kansas City Power & Light, will feature an eight-foot Komodo dragon who is able to eat 80% of his own body weight in one meal. A visit to the Zoo would not be complete without an up-close experience in Farmland in the U.S.A. Domesticated animals from around the world are featured in the Zoo's International Festival. Since its inception in 1909, the Kansas City Zoo has gone through many transformations including a recent $71 million overhaul. Future plans for the Kansas City Zoo, already the tenth largest zoo in the country, include the addition of Asia and North and South America areas. The Zoo is located in Swope Park at 6800 Zoo Drive, Kansas City, Missouri. For more information, call (816) 871-5701. The most compelling, immersing wave of film technology has arrived, and it's right in your own backyard! The Sprint IMAX Theatre, located in the Deramus Education Pavilion at the entrance to the Kansas City Zoo, provides adventure beyond your wildest dreams. The IMAX system has its roots in EXPO '67 in Montreal, Canada where multi-screen films were the hit of the fair. A small group of Canadian film makers/entrepreneurs decided to design a new system using a single, powerful projector, rather than the cumbersome multiple projectors used at the time. The result: the IMAX motion picture projection system which would, unknowingly at the time, revolutionize giant-screen cinema. The technology behind the Sprint IMAX Theatre puts visitors right in the center of the action. IMAX uses the largest film frame in motion picture history - ten times the size of a conventional film frame. This technology creates images 6 1/2 stories tall and combines them with 12,000 watts of digital sound to take you places you've only dreamed. Explore the hidden wonders of active volcanoes, scale a two-mile vertical wall of ice, migrate with the whales, and venture to Alaska. Passports are not required. If you can imagine yourself there, the Sprint IMAX Theatre will take you, and it's only at the Kansas City Zoo. Call (816) 871-IMAX for day and evening show times and ticket information.